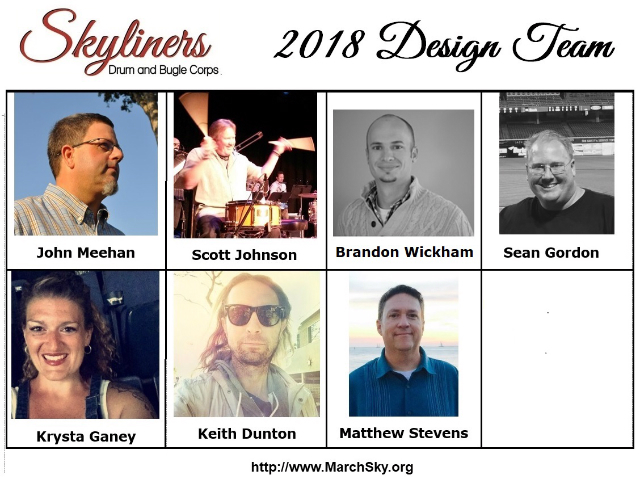 The Skyliners Drum & Bugle Corps is pleased to announce their 2018 Design staff: BRASS ARRANGER – John Meehan; BATTERY ARRANGER; Scott Johnson; PIT ARRANGER and Sound Designer – Sean Gordon; VISUAL DESIGNER – Brandon Wickham; and Krysta Ganey – COLOR GUARD DESIGNER. Keith Dunton is the PROGRAM COORDINATOR, and Matthew Stevens is the COLOR GUARD/VISUAL SHOW CONSULTANT. John Meehan is very excited and honored to return to the Skyliners for a second season as brass arranger. He has been composing and arranging since 1992. Current and past clients include Eden Prairie High School (MN), James Taylor High School (TX), American Fork High School (UT), Clements High School (TX), and Amador Valley & Homestead High Schools in California. John is also the brass arranger for the Yokohama Scouts Drum Corps (Japan), the Kidsgrove Scouts Drum Corps (England), and brass consultant for The Academy Drum Corps (Arizona). Notable career achievements include lead designer for the System Blue and King marching brass instruments, development and production for Sample Logic/System Blue sound libraries, and performing (as a percussionist) on the movie soundtrack “Monsters University”. John is a System Blue and Conn-Selmer artist, exclusively uses Sibelius, and lives in California with his wife Jackie, their 3 daughters, and two rescue dogs. Battery Arranger Scott Johnson’s musical training began at the age of four when he began taking drum lessons from a local percussion instructor. At the encouragement of this instructor he became involved in the Drum and Bugle Corps activity. Before his 5th birthday, Scott joined the Red Knights Drum and Bell Corp. and later graduated to the Royalairs Drum and Bugle Corps. Scott remained with the unit until he joined the Blue Devils Drum and Bugle Corps at age 18. He was a marching member in the Blue Devils snare line from 1976 through 1979. He became a member of the Blue Devil staff as a Percussion instructor from 1978 through 1989 and later rejoined the organization in 1994 as the Director of Percussion and Percussion Arranger. Scott is also the former Percussion Arranger for Riverside Community College, as well as the arranger for Beatrix Drum Corp. from Holland, San Francisco Renegades Drum and Bugle Corps, and arranger for many drum corps and marching bands in the United States as well as in Japan. Personal awards include 13 DCI World Championships, 12 DCI High Percussion titles, 2 WGI World Championships, 3 DCA championships, 2 DCA High Percussion titles, 10 DCE championships, 9 DCE High Percussion titles, 4 High Percussion titles in Japan, and the 1977 DCI & PAS Individual Snare championship title. Scott’s judging assignments have included numerous marching band and percussion competitions throughout the world, including PAS Championships, WGI Championships, South African Championships, Indonesia Championships. and the Bands of America Grand National Championships. Scott was inducted into the WGI Hall of Fame in 2012, and will be inducted into the DCI Hall of Fame in the Summer of 2012. Sean Gordon, the 2018 Front Ensemble Arranger and Sound Designer, is among the new wave of up and coming instructors that fits the positive trend of “paying it forward”. The idea that those who were once performers, athletes or students become involved in similar educational paths of their respective mentors; to preserve the ideals and traditions passed down and deliver them a new generation. Sean’s mallet percussion training began as a seventh grader while attending Canyon Hills Jr. High. He continued to play mallets for Ayala’s percussion section all four years before graduating and participating with groups such as Pulse Percussion, Riverside Community College, Impulse Drum and Bugle Corps and aging-out with the 2007 DCI Champions, The Blue Devils, as a mallet percussionist. During the course of his indoor career, Sean returned to his alumni as a mallet tech in 2007, holding the position until he was promoted to Front Ensemble Caption Head in 2009 – working with the likes of his former instructor, Caleb Rothe, Bryan Nungaray, and Jim Wunderlich. He began arranging for the 8 time PSCW Champion Concert Percussion Ensemble in 2016, and finished his tenure with the ensemble after completing the 2017 indoor season. Sean’s teaching prowess has also migrated to the drum corps and independent percussion ensemble scene, as he has worked as the front ensemble instructor for The Academy (2011-2012), The Mandarins (2010), Pulse Percussion (2009-2011) and currently teaches at The Blue Devils Drum & Bugle Corps (2013-Present). Sean currently resides in Eastvale, CA and is a proud educational endorser of REMO drumheads, and Innovative Percussion sticks and mallets. Brandon Wickham, Visual Designer, is an international clinician, visual designer, and drill writer from California. He began his marching career as a baritone player in 2004 with the Vanguard Cadet Drum and Bugle Corps from Santa Clara, California and went on to join the Blue Devils Drum and Bugle Corps in 2005. Since aging out from the Blue Devils organization in 2008, Brandon has gone on to work with several award winning high school programs throughout California and the Mid-Western United States. From 2011-2015, Brandon worked as a designer and visual caption head of the 2011 and 2012 WBA Champion and 2013 BOA Grand National Finalist, Ayala High School Band and Color Guard, as well as the 2013 WBA Champion Upland High School Marching Band, and the 2014-2105 WBA class champion Cerritos High School. After the 2015 competitive season, Brandon moved to Indianapolis, Indiana where he has since joined the staff of several prestigious high school programs including the Avon Marching Black and Gold, Ben Davis Marching Giants, the Center Grove High School Marching Band. Brandon works with several different indoor percussion ensembles throughout the western and mid-western United States. Over the past several years Brandon has had the opportunity to work with the percussion programs at Ayala High School, Center Grove High School, Etiwanda High School, and Ben Davis High School, as well as a number of other scholastic open, and independent world groups across the country. As the school year comes to an end, Brandon spends his time teaching throughout the summer with DCI. After being asked to join the visual staff of the Pacific Crest Drum and Bugle Corps in 2013, Brandon went on to become the visual caption head of the Academy Drum and Bugle in 2014 and 2015. After two successful seasons with the Arizona Academy, Brandon was asked to join the visual staff for the Blue Devils Drum and Bugle Corps in 2016. When he is not teaching in the United States, or near home, Brandon works as a visual designer and clinician for several groups across the United States as well as international groups in China, Taiwan, South America, and England. As a visual designer, Brandon has designed drill for several groups across the U.S. as well as marching ensembles in Taiwan and China. Brandon’s work has been performed and awarded at several local and state competitions around the United States and has also been performed at the Bands of America Grand National Championships in Indianapolis, IN, and the Winter Guard International World Championships in Dayton, Ohio. Brandon graduated with High Honors from California State University San Bernardino where he earned his Bachelor of Arts degree in Business Administration with and emphasis in Marketing. Brandon is also a member of the Beta Gamma Sigma Honors Society for Business. Keith Dunton, Show Coordinator, is an International music clinician, freelance musician, and marching arts producer living in Los Angeles, CA. He holds a degree in Bachelor of Music: Trumpet Performance from St. Olaf College and is a voting member of the National Arts, Recording & Sciences (NARAS) in songwriting, composing and engineering. He is currently a part of the teaching faculty at the 18-time World Champion Blue Devils Drum and Bugle Corp out of Concord, CA. Krysta Ganey, Color Guard Designer, marched with the Phoenix Marching Band and Color Guard from 1998-2003. She started at Jordan-Elbridge Marching Band and launched the winter guard program in the 2003-2004 winter season. Krysta ended the 2007 year at Jordan Elbridge and started with Liverpool, where she was the JV Director/Designer from 2008 – 2009. In 2009 Krysta also became the Director of the Liverpool Varsity guard, where she designed from 2009 – 2011. She is currently the Liverpool Varsity Director. Under her leadership, Liverpool became WGI Semi-finalists this year, for the first time in program history! Krysta’s Drum Corps experience includes marching with the Kingston Grenadiers from 2003-2005; she was hired as 2006 Designer before the corps folded. In 2006 Krysta marched with the White Sabers, and marched with the Empire Statesmen from 2007-2010. On the Guard staff with the Empire Statesmen in 2011, Krysta was hired as their Caption Head in 2012 – where she also designed – a position she held until they folded after the 2013 season. After taking a couple years off she was hired as the Color Guard designer for The Skyliners for the 2016 season. This will be her third season with The Skyliners. Matthew Stevens, Visual Show Consultant, has been involved in the marching arts for over 25 years. He currently serves as an adjudicator for Winter Guard International and specializes in Percussion Visual General Effect. Matthew also serves as an adjudicator for the Mid East Performance Association; Ohio Indoor Performance Association; Indiana Percussion Association; Tristate Marching Arts; Rocky Mountain Percussion Association; Mid Continent Color Guard Association and the Ohio Music Education Association. Matthew served as the Educational Director for Adjudicators for MEPA during 2013-2014. He is a certified adjudicator through the Judges Academy sponsored by Marching Roundtable. He is currently designer for Artistry IN BLUE Winter Guard, a WGI Independent A finalists and three-time winner of the WGI Fan’s Favorite award in 2013, 2015 and 2016. He has served as program coordinator and drill designer for many marching bands, winter guards, and winter drumlines in the Midwest. Matthew received his Bachelor of Music Education from Otterbein College in Westerville, Ohio and a Masters of Theological Studies (MTS) from Trinity Lutheran Seminary in Bexley, Ohio. He is currently the Director of Giving for Church World Service, an international humanitarian aid organization. He lives in Columbus, Ohio and is active in his local community. Keep up-to-date with us via our website, Skyliners Drum & Bugle Corps Website and join the Skyliners 2018 Interest Page at Skyliners 2018 Facebook Interest Page. For more information, please contact Joshua Delanuez, Recruiting Events Coordinator info [at] marchsky [dot] org or go to Skyliners Drum & Bugle Corps Join Page. Posted by News Editor on Thursday, November 2nd, 2017. Filed under Current News, DCA News, FrontPage Feature.